Label: Sticker inside front cover, upper left corner, incribed in ink: "3.234" (Rothschild inventory number?). Secondary Inscription: Inscribed first flyleaf, verso, center, in pencil, in a post-medieval hand, "33" (encircled). Inscribed third flyleaf at the end, lower right, in pencil, in a twentieth-century hand, "1-24 8, 25 4, 26-45 8, 46 10 [second # in each pair in superscript] = 366 leaves, the last two blanks / coll. compl. HPK per JSK x 168" (collation by John S. Kebabian for H.P. Kraus). Inscribed third flyleaf at the end, lower right, in pencil, in a twentieth-century hand, "KCO.29 / L (? partially effaced)". The most famous historical record of Europe in the 1300s, the monumental Chronicle was written in French (Chroniques) by Jean Froissart and recounts the major political and military events from around 1322 to 1410. Focusing on the rivalry between England and France, the Chronicle is a basic resource for the study of the Hundred Years' War. Froissart also described the affairs of other realms, though largely as they related to the complex network of overlapping and shifting alliances around England and France. 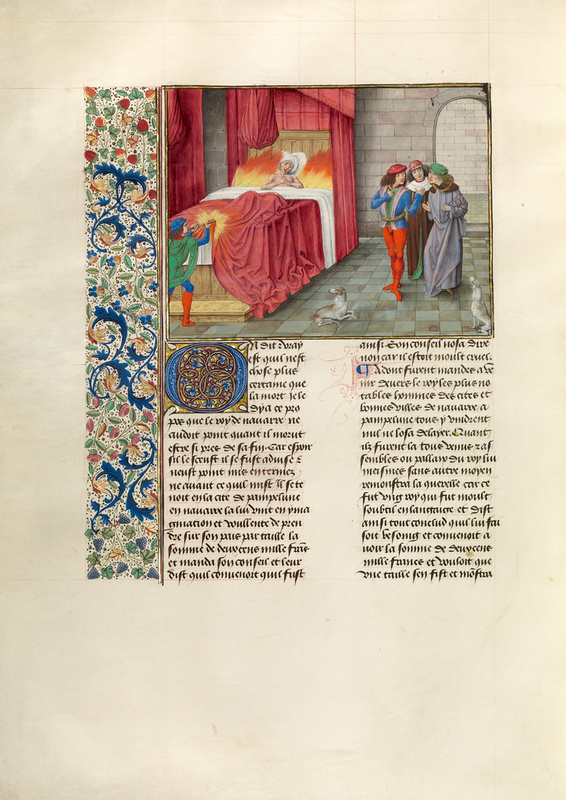 The Getty Museum's manuscript contains the third of four books; its 730 pages cover only the period from 1358 to 1389, an indication of the level of detail Froissart sought to impart. The Museum's volume, from about 1480, shows the lasting esteem that the Chronicle enjoyed: new copies of the text were still being made about seventy years after the author's death. The book was made in Flanders, perhaps in Bruges. The choice of subjects for the sixty-four miniatures strongly emphasizes events involving the English, evidence perhaps that the book was produced for the English market. Indeed, King Edward IV, who built the first royal library in England, may have commissioned it. von Euw, Anton, and Joachim M. Plotzek. Die Handschriften der Sammlung Ludwig. 4 vols. (Cologne: Schnütgen-Museum, 1979-1985), vol. 3 (1982), pp. 257-66. "Manuscript Acquisitions: The Ludwig Collection." The J. Paul Getty Museum Journal 12, 1984, p. 301. The J. Paul Getty Museum Handbook of the Collections. 1st ed. (Malibu: J. Paul Getty Museum, 1986), p. 79, ill. The J. Paul Getty Museum Handbook of the Collections. 2nd ed. (Malibu: J. Paul Getty Museum, 1988), p. 79, ill. Masterpieces of the J. Paul Getty Museum: Illuminated Manuscripts (Los Angeles: J. Paul Getty Museum, 1997), pp. 102-3, entry by Thomas Kren. Lilly, Melinda. Knight. People of the Middle Ages (Vero Beach, FL: Rourke Publishing LLC, 2002), pp. 20-21, ill.
Lilly, Melinda. Princess (Vero Beach: Rourke Publishing LLC, 2003), pp. 16-17, ill.
de Hamel, Christopher. Les Rothschild collectionneurs de manuscrits. Conférences Léopold Delisle (Paris: Bibliothèque nationale de France, 2004), no. 21. Selliers, Diane de, ed. Le Moyen Âge flamboyant: Poésie et peinture (Paris: Editions Diane de Selliers, 2006), pp. 70-71, ill.
Morrison, Elizabeth. Beasts: Factual & Fantastic (Los Angeles: J. Paul Getty Museum; London: The British Library, 2007), pp. 60-61, fig. 47. Croenen, Godfried. "La tradition manuscrite du Troisième Livre des Chroniques de Froissart," In Froissart à la cour de Béarn: L'Écrivain, les arts et le pouvoir. Valérie Fasseur, ed. (Turnhout: Brepols, 2009), pp. 17, 20, 17, 28, 32, 35, 37-41, 43, 45-49, 53, 56. Morrison, Elizabeth, and Anne D. Hedeman, eds. Imagining the Past in France: History in Manuscript Painting, 1250-1500 (Los Angeles: J. Paul Getty Museum, 2010), p. 234, under no. 41, entry by Anne D. Hedeman; pp. 273-275, no. 52, ill., entry by Erin K. Donovan. Morrison, Elizabeth. "Beyond French Manuscripts." In Imagining the Past in France: History in Manuscript Painting 1250-1500. Elizabeth Morrison and Anne D. Hedeman, eds. (Los Angeles: J. Paul Getty Museum, 2010), p. 260. Kren, Thomas. Illuminated Manuscripts from Belgium and the Netherlands in the J. Paul Getty Museum (Los Angeles: J. Paul Getty Museum, 2010), pp. 23-24, 34, 90-94, ill., frontispiece ill.
Croenen, Godfried. "Froissart Illustration Cycles," In Encyclopedia of the Medieval Chronicle. R. G. Dunphy, ed. (Leiden and Boston: Brill, 2010), p. 647. Châtelet, Albert. "L'évocation de l'histoire en miniatures en France (1250-1550)." Art de l'enluminure 36 (March-May 2011), p. 75. Schoenaers, Dirk. "History of Conflict or Manual of Conduct? : Continuity and Change in the Illustration and Interpretation of Book Three of Froissart's Chroniques." Queeste 18 (2011-2012), pp. 109-10, 112, 115, 117, 119-22, 124-33, 135-37, 139, 140n141, 141, fig. 7. Keene, Bryan C. Gardens of the Renaissance (Los Angeles: J. Paul Getty Museum, 2013), pp. 60-61, ill.